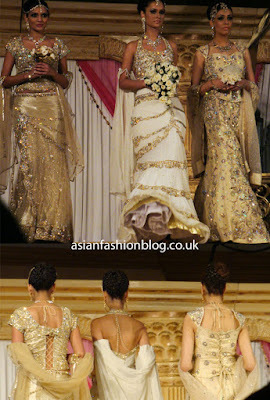 Khushboo's by Chand went for a very different theme for their second catwalk slot at the Asiana Bridal Show in Birmingham. 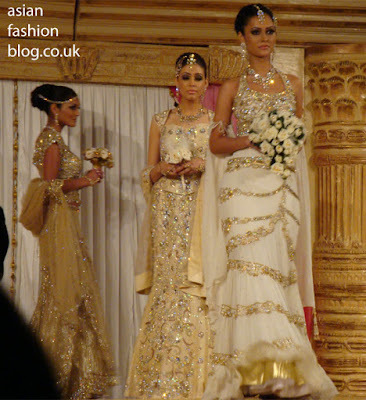 Their first show was full of colourful bridal outfits (click here to see the pics if you missed it) and they contrasted this with a range of white and gold outfits which I think were more registry-style. 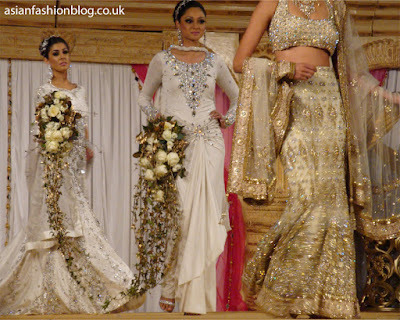 None of these really stood out to me as being something amazing, and what is going on with the white and gold skirt?? Maybe it's just me but the embroidery looks like it went wrong!! One thing I did like about the white outfit was the back, which you can see in the pic below - I like the beads/peals going across the back with the halterneck top. 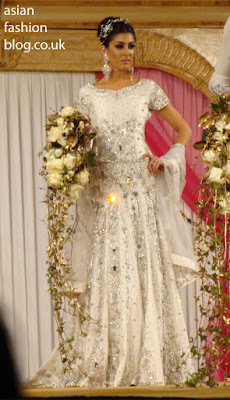 The only other stand-out peice for me out of this collection were the white dresses, which they have in the scene above and below. I'm a bit undecided on these because I like the fact that they are something different and think the draping in the skirts look fab, however the tops for me are a real let-down. I think they might have looked a bit better if they were sleeveless, but perhaps the idea of these was to create an outfit for people who want to cover up/not show off too much skin...but if that was the case, people who cover up for religious reasons probably wouldn't wear something so skin-tight anyway!